The Euro fell to new yearly lows during yesterday’s session after the ECB changed its outlook on rate hikes, stating that they would remain at their present levels until at least the end of 2019. Additionally, GDP numbers missed the forecast by 1.1% vs 1.2% YoY, adding more pressure on the single currency. The ECB Chairman also acknowledged that the near-term growth outlook is weaker-than-anticipated, blaming weakness mostly to external factors. On the other hand, the US Dollar benefited from better-than-expected employment data, while the Unit Labor Cost in Q4 increased to 2.0%. Today, will be a quite busy day on the economical front, as it will kick start with Chinese February Trade Balance data with the focus on US-China trade deficit, later followed by the US NFP report which could give the US Dollar an additional boost if the data is positive. The Euro printed new yearly lows and fell as much as 1.1177 where price found temporary support. 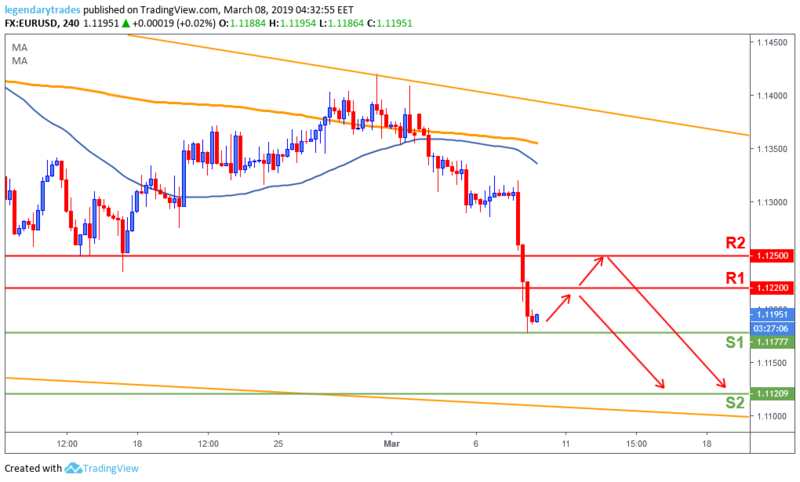 A pullback towards 1.1220 (R1) or even 1.1250 (R2) is expected before attempting to break the recent support 1.1177 (S1) to potentially head towards 1.1120 (S2).